← The fear of success. Four-year-old advice from the farm. Farms are full of hazards that could maim or kill you. Don’t play on or around haystacks, they can tip over without notice. Stay clear of resting farm equipment, they have sharp features that can impale you. The animals are unpredictable and might charge, so keep a wary eye when out in the pastures. And a host of other things. My four-year-old son experienced this first hand over the Thanksgiving weekend, but in return, his youthful innocence reminded me of an important life lesson. Gone for Black Friday with my mother-in-law and sister, I left my children in the care of their grandpa and dad. 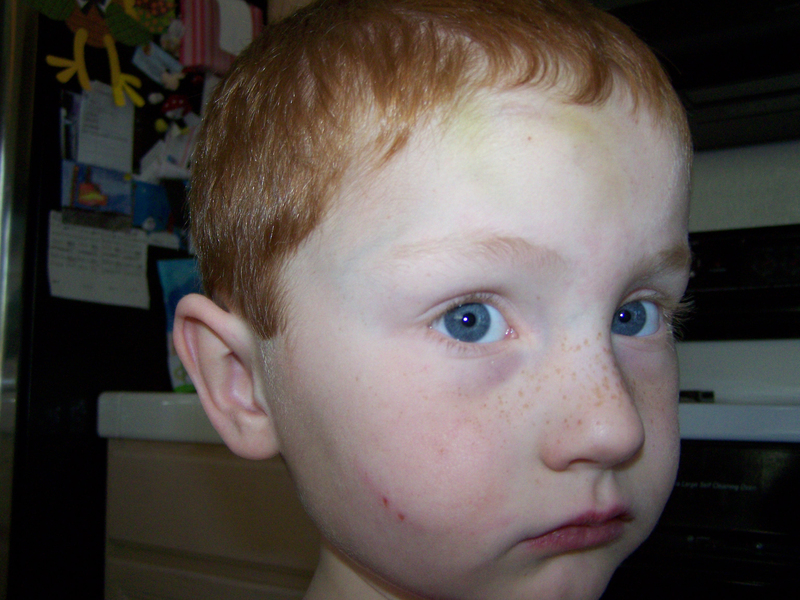 When I returned from shopping in the late morning, my four-year-old wandered into the farmhouse with a massive bump on his forehead. It was so large I couldn’t believe the skin hadn’t cracked open. He had run into the end of a metal pipe, called a water line, my oldest son had been carrying. I knelt on the kitchen floor, crooning and touching his wounded head, consumed with the size of the injury. How could he possibly enjoy the rest of our vacation with this? His little hand pulled mine away and said, “If you stop touching it—I fine.” Then out he went to explore and play. I shook my head at his response, until I realized the wisdom in his words. Everyone experiences the pain of an injury in their life. The physical gashes we can see or the emotional ones hidden within, it doesn’t matter—they all hurt. But to obsess over these past wrongs is dangerous. You’ll only find yourself engulfed in misery, unable to see the joy of the world around, waiting to be explored. Don’t magnify these injuries, let them go. Like my son said, “Stop touching it,” and you’ll be fine. 1 Response to Four-year-old advice from the farm.